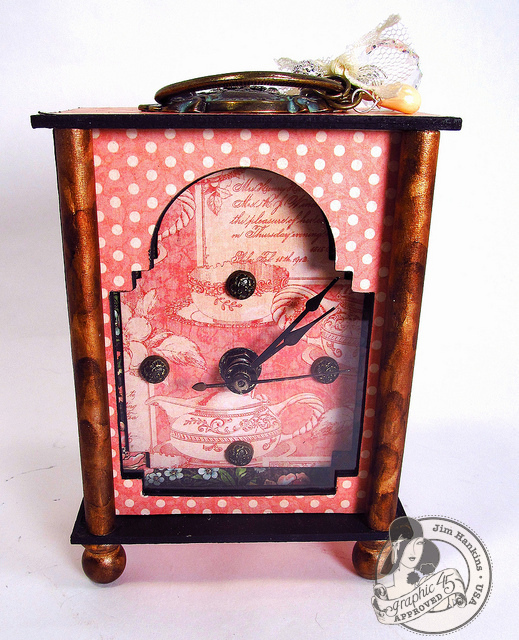 The Gentleman Crafter: A Ladies Diary Carriage Clock! Revealed! 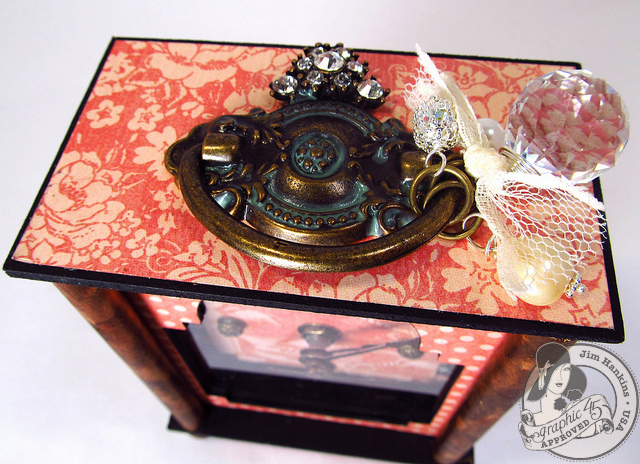 Thank you for joining me over at Graphic 45's blog to check out, A Ladies Diary Carriage Clock. If you haven't gone over, please go!!!! By now, you surely must know how much I love Kristin Wilson of Kristin Wilson Handmade...She has created the coolest things on the G45 blog today! Gotta see 'em! What I have created you ask? 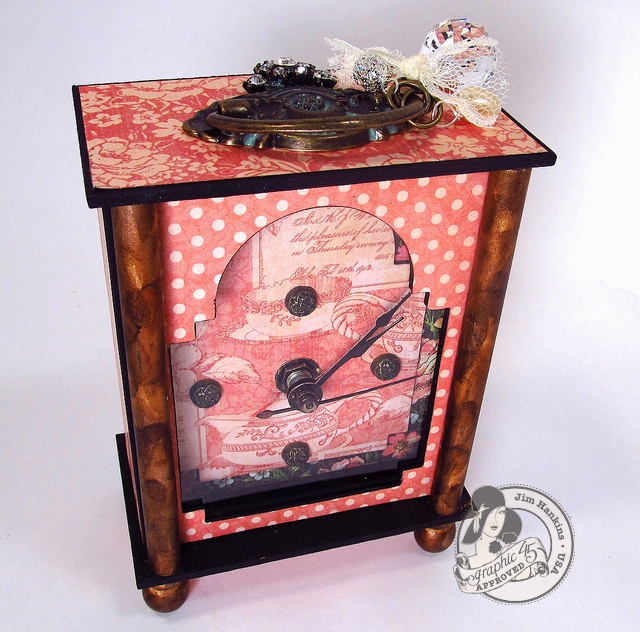 A Carriage Clock from the lovely and beautiful Graphic 45's, A Ladies Diary paper collection. I simply love this little clock. So many designers are making fabulous big clocks. God knows I love them and have done them, but this time I went small and simple. I think that is why I love it so much. I hope you do too! This clock would make a wonderful gift for the upcoming holidays and there will be a pattern for it soon. I know, you've heard that before! LOL! But, I love this little clock so much I want to make it in other papers as well. So a pattern is inevitable...It really is so easy and fast....I promise....I may do my first kit...what do you think? Thanks for looking and have an awesome day! Just been drooling over this at G45 - amazing crafting as always! Gorgeous!!!! Love how you've put this all together!!!! Jim your clock is really fabulous! If you do a kit will you make the pattern alone also available for those of us who can't afford kits??? That would be great. Hope you feel better soon. Jim, I love the clock, it is beautiful. I would love a pattern. I love all the kits out there but unfortunately they are out of my budget :-( Hope you are feeling better! Yes, I agree, most of the kit prices are waaay too expensive, and you may already have some/most of the components - just need the pattern! Beautiful. Yes to a kit as long as you ship to the UK. Hope you are feeling better. Jim, I"d LOVE a pattern (and possibly a kit)of this gorgeous clock. Your blog of your trip and projects along the way was a pleasure to read. I hope you are over the "crud". love the clock (btw, i'm no longer mad at you for not drawing my name!!! !LOL Hope Susan loves her "stash")especially love the faux wood on the edges...looks like burled wood in the pic...did you do it with paint??!!! looks like it....would love a pattern for it and maybe a kit if it's not too much...ya know...gotta get some more dylusions ink!!!!!!!!!!!!! Hope you are on the mend soon.....um...too much standing out in the rain looking in Whimsdooodle's window, perhaps????!!!! Really, hope you feel better soon. I would buy a kit in a heartbeat. Man cannot live by crafting alone! He must have money to buy his wares! Jim, your clock is fantastic! A pattern would be wonderful; a kit would be great. Anything you choose to do would be received with open arms! Thanks for the constant inspiration. I just gave a friend a birthday card modeled after your Ladies Diary card and she absolutely loved it. She is taking it to her family in Dallas over the Thanksgiving holiday to show it off. Your talented ideas travel everywhere! I too want a kit or at the very least a pattern since I have a stash and a half of papers I could use. Oh this is just darling - simple but definitely stately! Love it! Great clock Jim you just keep doing things guys that knocks your socks off. You must not be that sick if you can create this! You are amazing. Love your stunning "little" clock! Can't wait for the tutorial at your esty site!!! I love this and can't wait for the tutorial. Know exactly what papers I'm using, Romance novel, and it's going into my craft room. I would buy that kit. I think I'd actually finish that kit. I've done well with your tutorials. I bought a 4 kit subscription from another website and after I tried the first one, I had scrap paper and no project. Hi Jim. I’ll just pop in to say thank you! Thank you because you share all the tutorials with us, they are amazing!!! Your fantasy has obviously no limits! Love it! Love this Clock! How small is the clock? I think it would make a great kit and you could do a U-Stream showing how to put it together! I love the projects you make. I also bought the fiskars PROcision bypass rotary trimmer after watching your video and I JUST LOVE THIS CUTTER! I cut heavy chipboard, foam core and fun foam that was super thick and it cut everything just beautifully. Also your idea for notching hinges with the fiskars zigzag punch was wonderful. I tried the one from EK Success sometime ago (it was like grassy fringe) but it didn't work as well until fiskars came out with this punch! Thanks for all of your projects and creativity to inspire the rest of us mere mortals! Oh WoW another stunning project. 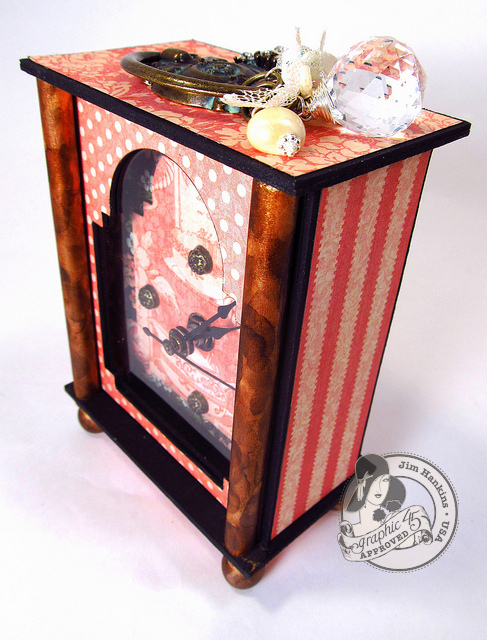 I will have to grab this pattern if you offer it in your shop :) The faux wood on the side had me doing a double take. Absolutely love it. Beautiful clock Jim! You're so clever! Love the clock Jim, stunninly crafted as all of you projects are. How simply wonderful! I always look forward to seeing what amazing art you will be sharing with us...and this was delightful. How clever! Love it!!! Can't wait for the pattern!!! Love this Jim. Remarkable. thanks as always for sharing. A kit would be super! And what a wonderful clock! How big is it--you say small, but HOW small? I think a kit would be fabulous!!!! Love the clock. Great idea for a gift with the holidays approaching. 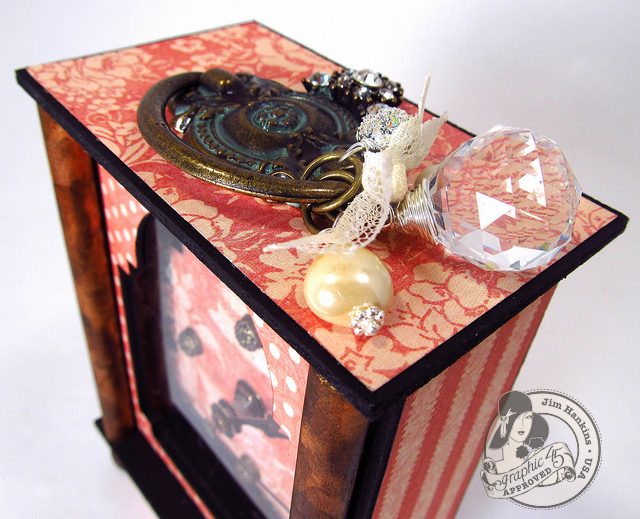 Looks like we need a choice between the kit and the pattern, BUT we definitely need SOMETHING for this beautiful little clock! And they said you couldn't do PINK!! They had NO clue!! I absolutely love the clock. Did you use and old clock and do this or make it from scratch? I can think of lots of papers I could use! LOL That clock has an update feel of modern look with a touch of old charm! Very awesome!!!! I'm a little late to the party Jim, I'm just now getting through emails and finding the clock I heard you talking about in the crypt video. LOVED the crypt by the way! Excellent techniques for all sorts of different occasions/uses! I also love the tag album inside! I look forward to your next pattern! Love this clock..can't wait for the pattern. This is a great gift idea for the holidays! Hope you are feeling better. Saw your clock on G45 ... so amazing!